← Doctor Monica, At Your Service! Celebrating Day of the Dead at the office. Four syllables I never thought I’d utter. They sound ridiculous, don’t they? But then, there you go. It wasn’t me who made them up. So here’s the deal: I’ve decided to take part in NaBloPoMo, more sensibly known as National Blog Posting Month. For some wild reason, November was selected by someone who shall remain nameless, as the month to post EVERYDAY. Which is absolutely absurd, if you ask me, because this couldn’t be a more stressful time of year! 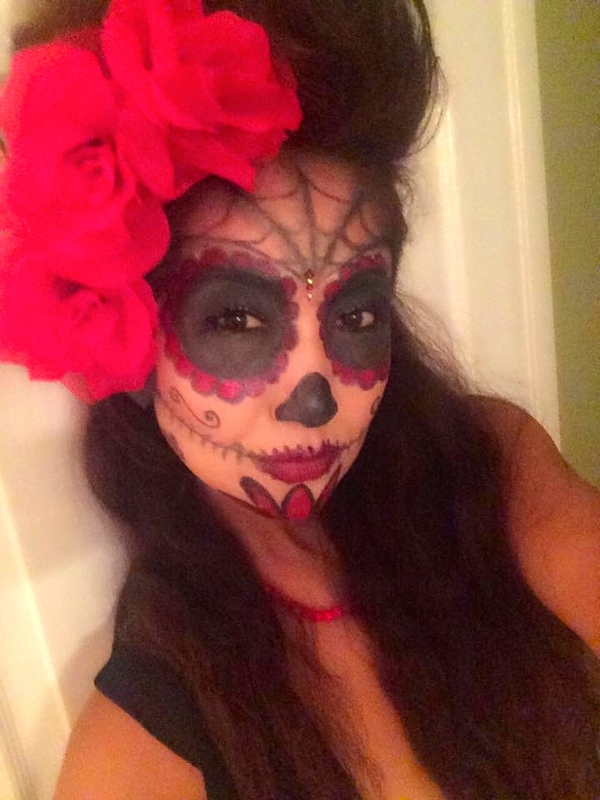 For Halloween, Zuliya uses sugar skull makeup. Absolutely divine! Think about it. The holidays are upon us. Shopping, partying, gallivanting and traveling to visit family and friends in snow-ridden places. Tis the season and all that. So why choose November, of all months, to commit to blogging every single day?? Wasn’t January available, the month when you’re supposed to be making resolutions anyway? This could’ve been my resolution–to blog everyday! Sigh. Yet here I am, with so much stuff already on my plate, and despite all common sense telling me to walk away from this highfalutin challenge, I’m stepping up and agreeing to take part, more or less. I say “more or less” because even though I’m agreeing to this absurdity, I may falter and miss a day or two. Or three or four. So please bear with me. I will do my best to keep these posts short and sweet. Since I’m going to be writing everyday, give or take a few, I will write whatever happens to be on my mind. Take today, for example. It’s November 1st, which also happens to be Día de los Muertos or Day of the Dead. I never celebrated or observed this holiday until I moved to San Diego. With our proximity to the U.S.-Mexico border, Día de los Muertos is a big deal in these parts, and over the years, I’ve developed an appreciation for it. Keep in mind, this is not a day for mourning, but an occasion to remember and appreciate those no longer with us, in an upbeat, positive way. Which is something we’ve been doing at the office for the past few years. 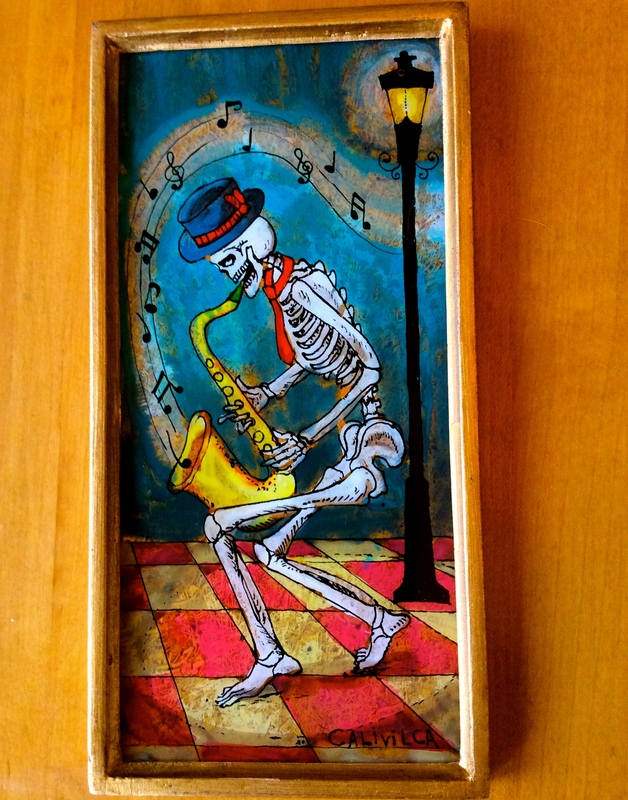 Of course, it helps that I’ve developed a fondness for Día de los Muertos art. Recently, I was at the Harvest Festival and found a piece that I just had to have. For, I just love the beauty of the holiday. So does Zuliya, one of the warmest, and most caring people I know, who also happens to be one of the best Zumba instructors around. For Halloween, she did herself up rather nicely in honor of the Day of the Dead. She looked spectacular! And speaking of Halloween, some of you may remember that last year at the office, a bunch of us dressed up as the rock group, Kiss, and we won the costume contest. 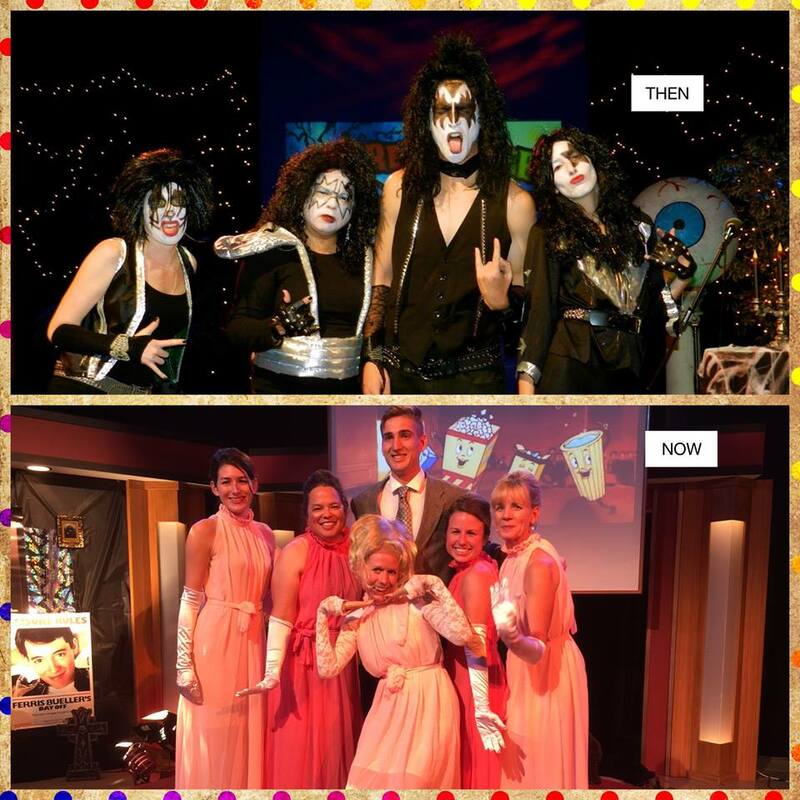 Well, this year we were decked out as Lawrence Welk and the lovely Lennon Sisters. We even did a choreographed rendition of “Up, Up and Away!” Who here remembers that song? Well, guess what? WE WON THIS YEAR’S CONTEST, TOO!! This is the original artwork I got at the Harvest Festival. The artist explained to me how he paints directly on the glass, and then flips it around. This method gives his work a bright and bold look. Special thanks to the team who worked so hard to make our win happen. My “aha!” moment was discovering that our office assistant, Hayley, has a talent for up-do’s. She made us look quite stylish, don’t you think? By the way, you have until November 5 to register your blog if you want to take part in NaBloPoMo and write daily posts this month. After all, if I can commit, then so can you. Fingers crossed! Bravo, Monica. I am Nano-ite as well, but not on the blogosphere. I can see myself visiting for some much needed relief from my daily word count. Brenda, feel free to stop by any time. Nano-ites are always welcome. Good luck with your goal! Monica, you ROCK!! I’ll bet you can come through this post-a-day challenge with much success! And congrats on your costume win — y’all look fabulous! Thank you! As a kid, I remember looking forward to seeing the Lennon Sisters perform. I thought they were so pretty and talented. So dressing up like them was like coming home–and fun! As for the post a day for 30 days, the verdict is still out. Let’s hope I make it through in one piece! Congratulations on the win, you all look great. Think next year you could aim to win three years in a row!!! Blog posting month seems interesting and I will follow with interest. I have noticed how many of the blogs I used to follow have fallen by the wayside in the last twelve months, and doing searches for random blogs shows that not updating a blog seems to be a growing trend. Robert, I’ve noticed that, too. Why do you suppose that is the case? It feels like old friends are leaving, so how do we get them back? I know I started this blog by posting twice a week. Then when I started my work blog, I went to once a week. Sometimes I think if I left and stopped altogether nobody would notice. But then here I am doing the opposite of that. We’ll see how it goes. you know the first word that comes to mind when I think of you? Ooh, thanks Kim! You have no idea how much that means to me. Thank you so much. Yes, life and the utter joy I find in the little things in life. That’s what’s important to me and keeps me going. Day of the Dead has a beauty all its own. I love the offerings we make in remembering. So, I’ve decided to join you in the challenge. I reckon it’s doable if you do it, Monica. This one’s better than WordPress ’cause you don’t have to commit to a theme, at least. Sir Henry can blog for you, if that counts. Yippee! Misery loves company and I can’t think of a better companion on this NaBo journey. And yes, Sir Henry can blog for me, but I already have Oliver working on a post. He’s excited, as its his first one. And you have Beatrice to help you! Aren’t we the luckiest?! Love your costumes and your ‘togetherness’. Of course you won! Posting everyday? Good luck with this, I have found it impossible to even keep up with reading everyday. I know, Val, it’s crazy to even think I can do it. Guess I love the idea of a challenge! This is my first year in many that I won’t be participating in some form of nanowrimo. It feels strange, but I’m taking a workshop in Monastic Writing. Good luck. I’ll be cheering you on. Monastic writing sounds intriguing, Renee. Hope you’ll share more about what it’s about. Good luck with the workshop! Looks like you had a wonderful time and congratulations on winning still again. Love the Lennon sister dresses and Lawrence looks very dapper himself in his skinny suit. “Up Up and Away” seems the perfect Champagne Music song. 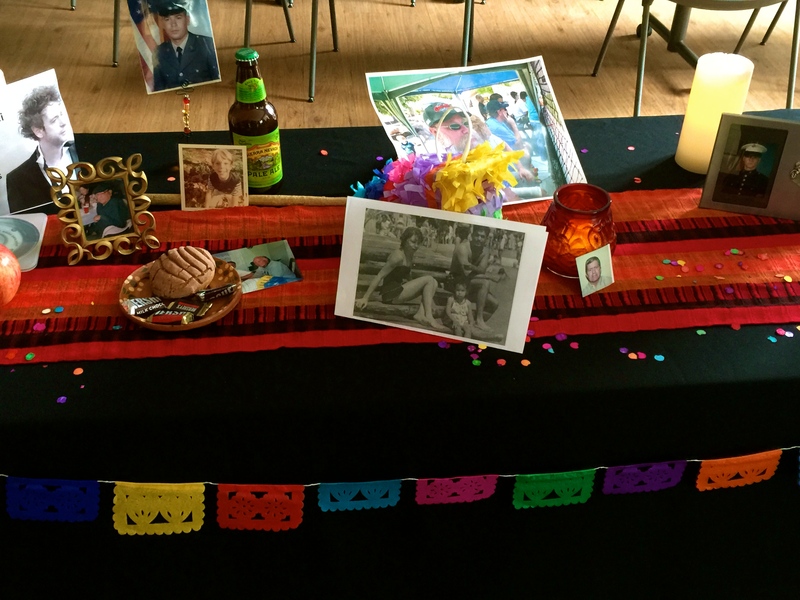 Your “ofrenda” display at the office is touching capturing the spirit of Día de los Muertos. Georgette, We scoured the internet in search of the most perfect over-the-top dresses. They also had to be reasonably priced. This is a Halloween costume, after all. And we found these one-size-fits-all gowns at a price too good to pass up! We started planning on Monday, ordering our supplies, then two rehearsals during lunch hours, and voila! Performance on Friday, with only one mishap! Our poor Lawrence Welk slipped on the soapy residue left by our bubble machine and came crashing to the floor just as our number ended. Yikes.